Let's Find Out...about single-click holds! One of our favorite features of the catalog is the option to enable single-click holds. Enabling this feature in your account skips the step of selecting a pickup location after you place a hold on an item. The hold will automatically be delivered to the default pickup location that you choose when you turn single-click holds on. This is a great feature if you always pick up the items you borrow at the same location. 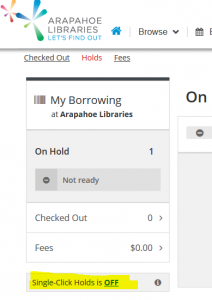 To enable this feature, log in to your library account, then select "On Hold" in the drop-down menu in the upper right hand corner. On the bottom left of your holds page, you will see the option to enable single-click holds. 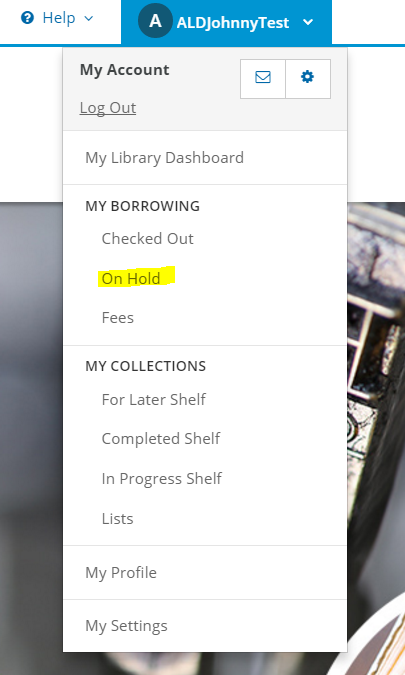 Select "off" to turn single-click holds on, and pick your preferred library—the library you want to have all your holds delivered to—then hit save. 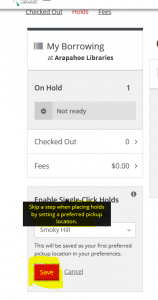 Now when you place holds, you will no longer need to choose your hold pickup location since it will be done automatically. Note: You will also get the option to enable single-click holds when placing a hold. Watch this quick video to see how easy it is to turn on!